I have been asked several times about my fonts that I use and thought I'd share a quick tutorial. There are hundreds upon hundreds of free fonts available for download. 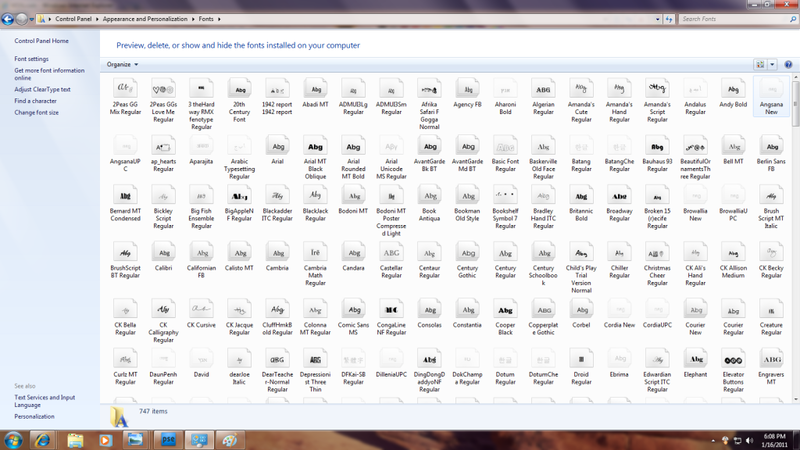 Once you find your favs, you must insert them into your computer's font folder in order to access them. Once they are plugged in they will work on any program on your computer that uses fonts including photoshop. You can add an additional layer in photoshop to add text to any image. I use Windows 7. If you use Windows Vista, XP, or Mac OSX, click here for a tutorial. 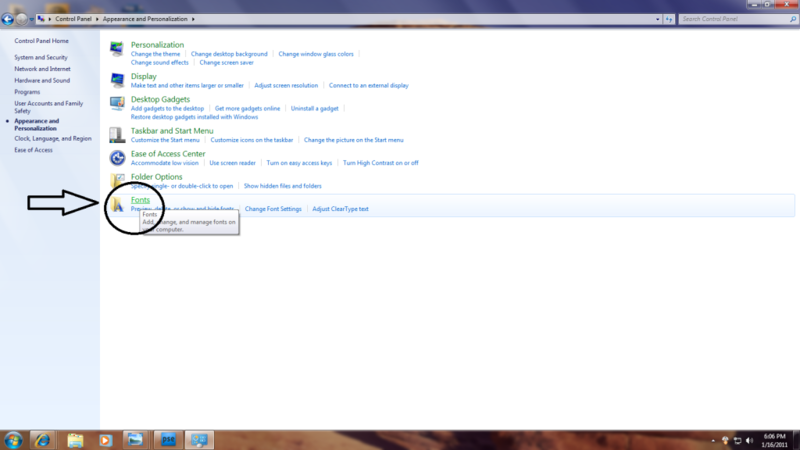 For Windows 7, locate your control panel. Then select appearance and personalization. You will see these choices (below). Click on fonts. Just copy and paste your unlocked font into this location. Tip: I download fonts and then extract them to my desktop for easy access and retrieval. Once they are plugged into my font folder I delete them off my desktop. Here are some of my favorite fonts. Download CK Ali's Hand here. Download VT Portable Remington here. Download 2Peas GGs Love Me here. Download Pea Kevin & Amanda here. Plus hundreds of others from her here. You can even choose to download her entire collection here. Submit your own handwriting and have her convert it into a font for you. She shares new fonts every Friday. A fabulous site to bookmark! I hope that you enjoy playing with some of these fonts. They can certainly transform any picture or scrapbook page! I love new fonts!!!! I have most of the ones you listed, but Im going to download the heart one right NOW! :) Thanks Lish! I've always loved your fonts. And love Pea! Thank you so much for sharing these tips. I absolutely love these fonts! There's nothing I love more than fonts. But I'm new to digital scrapbooking and not sure how to do a lot of stuff. This was the best thing for a Monday morning. Thank you for doing this so much!!! I am a fellow font fiend. I don't have but one of those fonts though. Thanks for sharing!! My current favorite font is displayed in my post titles and sidebar titles. It's called Riot Squad. A couple more fonts I love: Mcgannahan, Adorable, Black Jack, Pea Squeaker and Pea Tracy (from kevinandamanda). I LOVE FONTS, and what a great tutorial, too! Awesome post Alicia! Glad you're here :) I will definately be downloading those hearts. I'm a fontaholic! That 1942 Report is so perfect. Thanks for listing this great collection of fonts! I'm always on the look out for new ones, but hate looking throw pages and pages of them. Downloaded all of them! What fun and funky fonts! And I thought downloading fonts required an advanced degree in computer science. Sweet! You explained it so even I could understand! Love it! Thank you for sharing! I love the 2Peas GGs font! I love some of these!! I am going to have to try downloading some of my own. Thanks for the insider tips. I love fonts! Kevin and Amandas Pea fonts are where I get most of mine! Love Becky higgens and Ali Edwards too! i need to try some of these fonts!